1. Pruning our summer- and fall- blooming shrubs. (Now is NOT the time for the early spring bloomers, like azaleas. Wait until after they bloom.) This afternoon, I plan to finally get around to the unruly vitex and butterfly bushes. 2. Pruning the Lilirope. At Clemson University, they put the mower at the highest setting and just run them over. Seems to work fine, but I'll stick to my pruners. 4. Organizing and taking inventory of garden tools, seeds, fertilizers, chemicals, etc. We got a good start on this yesterday. 5. Pick up some of the sticks left over from the ice storm and dead annuals. 6. Collecting plastic soda bottles to fill with sugar water and use with the hummingbird feeder. 7. Planting berry plants like blackberries or blueberries. I'm planting some blueberries this year. 8. As a side project, I'm building a container water garden, so I'll be ready when the water lilies arrive at the nursery. That should be enough to keep us busy! While many of us are dreaming of the fantastic flowers that await us this spring, have you ever wondered why there are so many beautiful colors to choose from? Part of the reason is that different animals are attracted to different colors. A colorful flower is just an advertisement to a humming bird or butterfly. "Come here, I have nectar" scream the flowers wordlessly through their bright colors. But not all animals are attracted to the same colors. Have you noticed how the bumble bees tend to flock toward blue and violet flowers, like clover or vitex? Meanwhile, I've watched hummingbirds feed on orange-red daylilies snubbed by the bees. Pollinators are particular about their favorite colors, leading to lots of color variation in wild flowers. This is fortunate, since it gives us more colors for us to choose from in our gardens. So what colors do critters prefer, and what's the attraction? It's more than just having a favorite color; there's good reasons for their selections. Moths and Bats tend to feed on white flowers. These animals both feed at night, and the white colored flowers reflect the most light, and therefore are most visible to night-time feeders. Some of these bat-fertilized flowers bloom only at night. I found a picture of a typical bat-pollinated flower posted on the UCLA botanical gardens' web site. As many of you gardeners know, butterflies have a keen sense of color. They flock to bright colors from yellow to blue to red. Common plants grown in butterfly gardens, such as the milk weed favored by monarch butterflies, come in bright pinks, oranges, and purples. Butterflies especially like the butterfly bush. I love to post pictures of the tiger swallow-tail and gulf fritlillary I've seen in my garden. 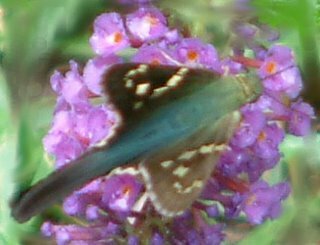 These butterflies love the tiny clusters of flowers on the butterfly bush since there's ample room to land and feed. Jill at Once Daily posted a lovely close-up of a feeding butterfly. Humming birds don't need a place to land, and often feed from long slender flowers. For example, their long beaks can easy feed from the trumpet vine as they hover. Hummingbirds like red and orange flowers, hence feeders are usually made in this color. Red is the least favorite color of bees, however. I love Jill's pictures of bees, like this Carpenter bee on a clover flower. Notice they tend to favor purples and blues. Unlike us, bees can also see UV light, and some flowers have UV lines that are invisible to us, but these UV markings are valuable guides to bees. On the otherhand, bees cannot see red. Just like UV light and infrared light is out of our human range of vision, the red spectrum of light is not visible to bees. So insects actually see color differently, as shown by this image projecting a bug's view of a plant on the Bog Blog. So if you're planning a colorful garden, thank those variety of pollinators out there, from bees to birds, for their discriminating tastes in color! 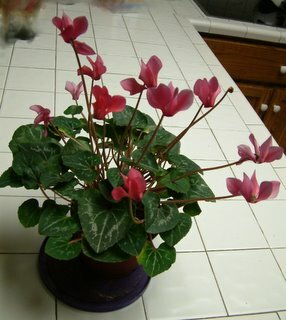 Cut flowers will be in demand this week, but what about giving your Valentine a flowering plant instead? I purchased the above two plants recently at a local hardware store. 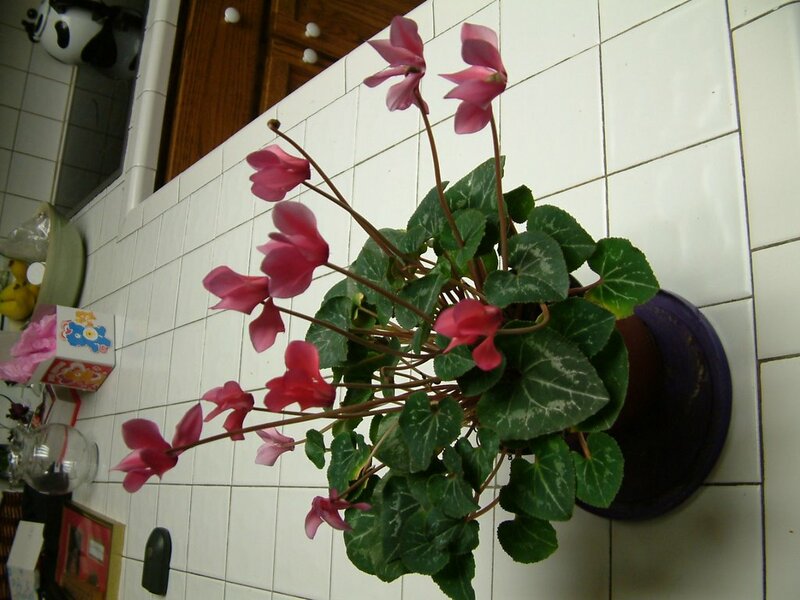 If you give them plenty of light and water, they can bloom and be happy for weeks. The bulbs don’t last as long, but if your valentine is an avid gardener, he or she might appreciate being able to plant it outside for next year. Since teaching pays just a little less than the average CEO salary, I've figured out how to make my first million a little quicker. Indroducing my new fashion line- chia accessories! 1. Smear shoes and purses with seeds. 3. Top off your ensemble with a chia hat! Wouldn't sprouts on your shoes put an extra bounce in your step? Anyone want to front me some start-up cash? I'm sure we could convince some Hollywood Prius-driving types that by wearing chia they are saving the earth. Plants clean the air, right? I attended a Gardening Forum this weekend in Greenville, SC, and learned a lot of interesting tidbits I hope to try out this year. Today I'll share one of my favorite stories from the day, as told by Jim Bennett. Jim introduced the concept of "grow bags" to me, although I guess they are popular other places. You take a packet of quality potting soil, poke some holes in one side for drainage, and then slice some room on the other side for your plants. Once transplanted, your plants should grow to cover the bag, and you have a lovely planting for your porch. Jim says he knew an older lady who grew everything this way. Everything from petunias to lantana to vegetables did well in the bags, but she found that her porch was a little shady during parts of the day. She was concerned that the plants weren't getting enough light. Jim stopped by one afternoon to see her pulling a wagon around her yard. When he got closer, he saw that she was pulling her grow bags of plants in the wagon. "What are you doing?" he asked. "I'm taking my veggies for a walk, " she replied. If you're interested in a set-up for indoor seed-starting, similar to the grow lights we use in the lab, you don't need to invest in one of these expensive units. A wire storage shelf works just as well, and then you can hang your light fixtures with chains. The lighting doesn't need to be expensive either; just typical cool fluorescent tubes will work. I do splurge on full-spectrum lights in my home system, since I grow mature plants and need the extra wavelengths to encourage flowers. My home-made unit cost about $60. 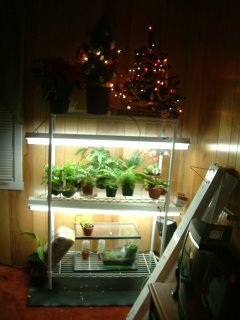 This is a picture from Christmas 2003 of my plant stand and grow lights. Perfect for a graduate student with no garden to call her own. Thank goodness times have changed! I've seen an avid gardener install several of these units in her basement to start seeds during the winter. That's a great strategy for giving some plants a head start, like tomatoes and impatiens. Most seed packets say to start the seeds 4-6 weeks before your frost date, and that time here in zone 7 is approaching soon! If you've been watching my hydroponic plants grow under their lights, from when we planted the seeds to tending the mature plants we have now, you can see that they work well in the classroom, too. We are starting the next stage in our hydroponic experiments tomorrow, so I'll post soon with our progress. 1. Mark the fluorescent tubes with the date of purchase with a permanent marker. 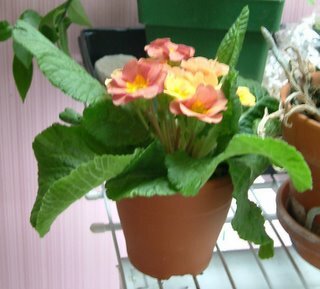 If you are going to grow plants under them full-time, they will dim and need to be replaced after about a year. 2. Incadensent bulbs generate a lot of heat and will fry your plants. 3. A rubber mat, as pictured here, can collect accidental drips. Now I also put the pots on a plastic tray full of gravel, which also cuts down on leaks. 4. Invest in a simple 24-hour timer and set it for 12-14 hours of "daylight". If you don't want your plant lights to wake you up while you're trying to sleep in on weekends, you can buy a fancier one.